Download "Title: Opening Plenary Session Challenges and Opportunities to Impact the Opioid Dependence Crisis"
1 The American Association for the Treatment of Opioid Dependence, provider #1044, is approved as a provider for social work continuing education by the Association of Social Work Boards (ASWB) through the Approved Continuing Education ACE) program. The American Association for the Treatment of Opioid Dependence (AATOD) maintains responsibility for the program. ASWB Approval Period: 6/12/2013 6/12/2016. Social workers should contact their regulatory board to determine course approval. Social workers participating in this course will receive (clinical or social work ethics) continuing education clock hours. OP - Plenary Title: Opening Plenary Session Challenges and Opportunities to Impact the Opioid Dependence Crisis Identify conference goals Describe Georgia s policies to facilitate improvements in the delivery of substance abuse treatment. Identify current challenges faced by treatment programs during this opioid dependence epidemic. Describe the national and state efforts to address opioid dependence. A1 - Workshop Title: Methadone 101 Describe why methadone is effective in treating opioid dependence and addiction. Discuss the efficacy and safety of methadone. Identify key bio-psychosocial issues patients may experience during medication assisted treatment. 2 A2 - Workshop Title: Rhode Island OTP Health Homes: Making a Difference in Patients Lives Define the components of an innovative state-wide collaboration model that optimizes CMS funding and resources. Explain how to develop and utilize a state-wide data management system for aggregation, integration and evaluation. Describe challenges and lessons learned, including responding to the impact of the ACA and Medicaid expansion on service provision. 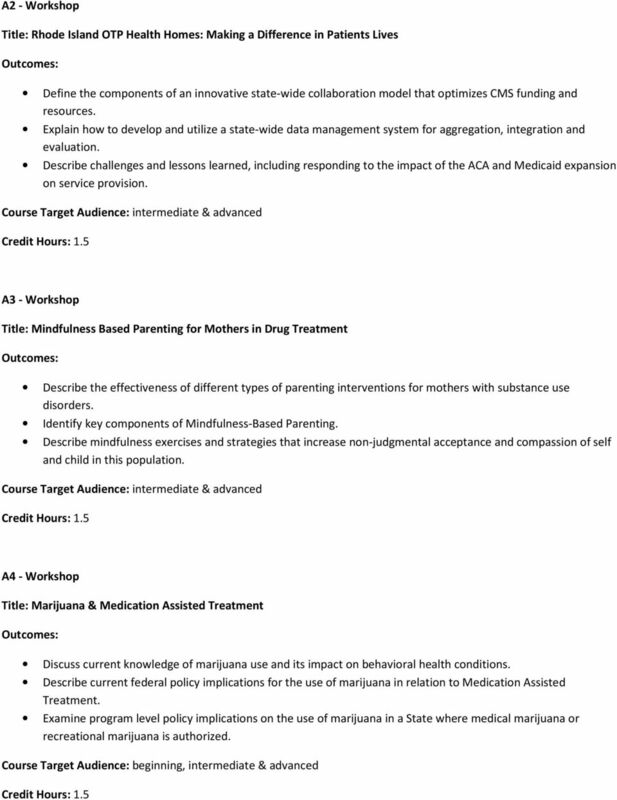 A3 - Workshop Title: Mindfulness Based Parenting for Mothers in Drug Treatment Describe the effectiveness of different types of parenting interventions for mothers with substance use disorders. Identify key components of Mindfulness-Based Parenting. Describe mindfulness exercises and strategies that increase non-judgmental acceptance and compassion of self and child in this population. 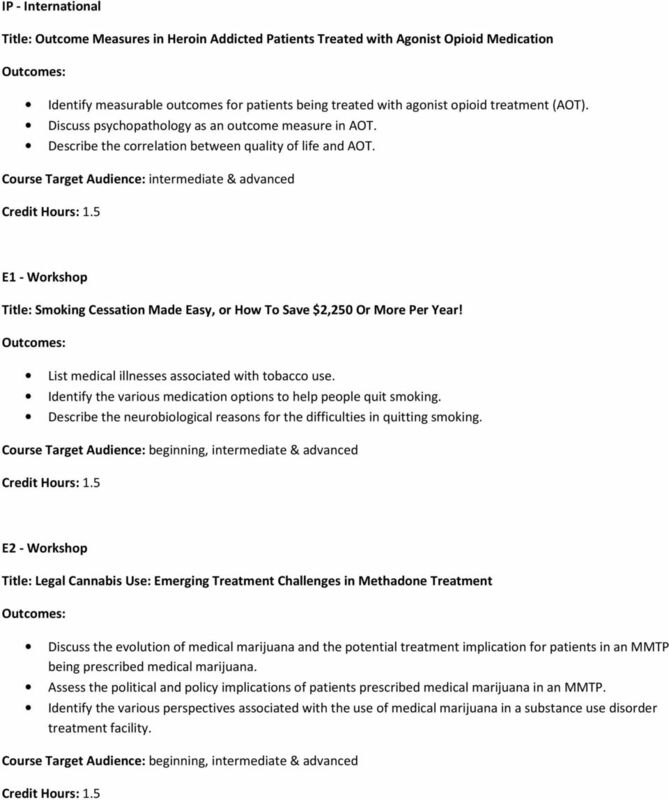 A4 - Workshop Title: Marijuana & Medication Assisted Treatment Discuss current knowledge of marijuana use and its impact on behavioral health conditions. Describe current federal policy implications for the use of marijuana in relation to Medication Assisted Treatment. Examine program level policy implications on the use of marijuana in a State where medical marijuana or recreational marijuana is authorized. 3 A5 - Workshop Title: Health Policy Opportunities & Challenges: Update from Legal Action Center Describe health policy changes happening on the federal level, particularly regarding implementation of health reform. 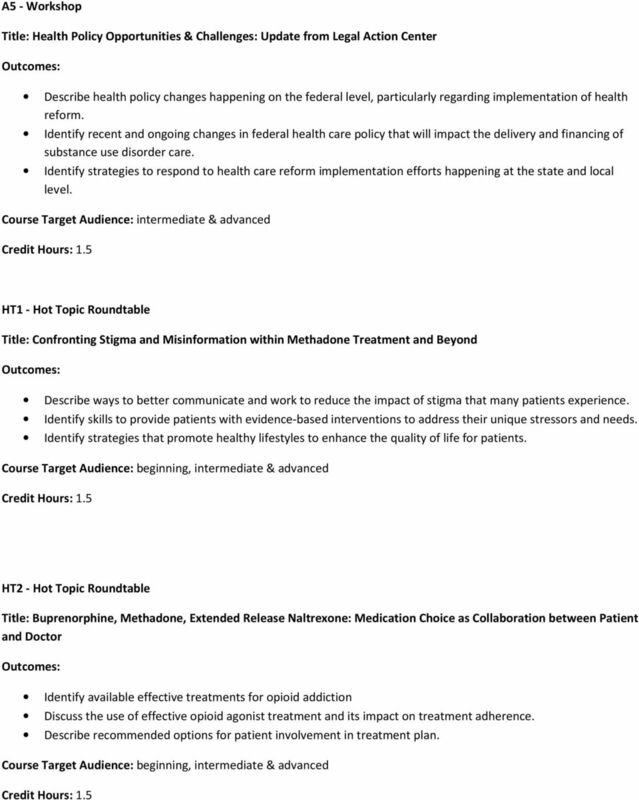 Identify recent and ongoing changes in federal health care policy that will impact the delivery and financing of substance use disorder care. Identify strategies to respond to health care reform implementation efforts happening at the state and local level. HT1 - Hot Topic Roundtable Title: Confronting Stigma and Misinformation within Methadone Treatment and Beyond Describe ways to better communicate and work to reduce the impact of stigma that many patients experience. Identify skills to provide patients with evidence-based interventions to address their unique stressors and needs. Identify strategies that promote healthy lifestyles to enhance the quality of life for patients. HT2 - Hot Topic Roundtable Title: Buprenorphine, Methadone, Extended Release Naltrexone: Medication Choice as Collaboration between Patient and Doctor Identify available effective treatments for opioid addiction Discuss the use of effective opioid agonist treatment and its impact on treatment adherence. Describe recommended options for patient involvement in treatment plan. 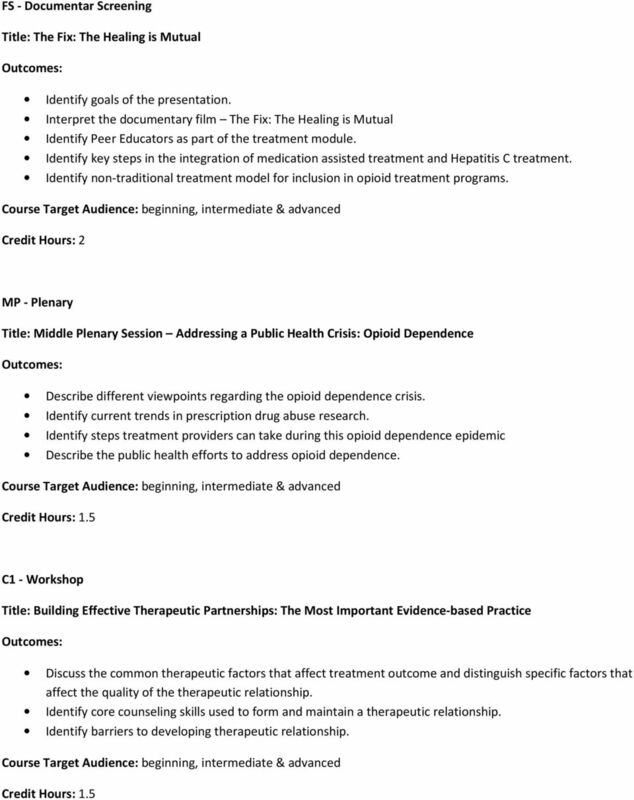 4 HT3 - Hot Topic Roundtable Title: Addressing Stimulant Use in the OTP Define issues surrounding the use of stimulants in medication assisted treatment. Explain potential challenges in the implementation of clinical guidelines. Identify patients at risk for using stimulants and receiving medication assisted treatment. 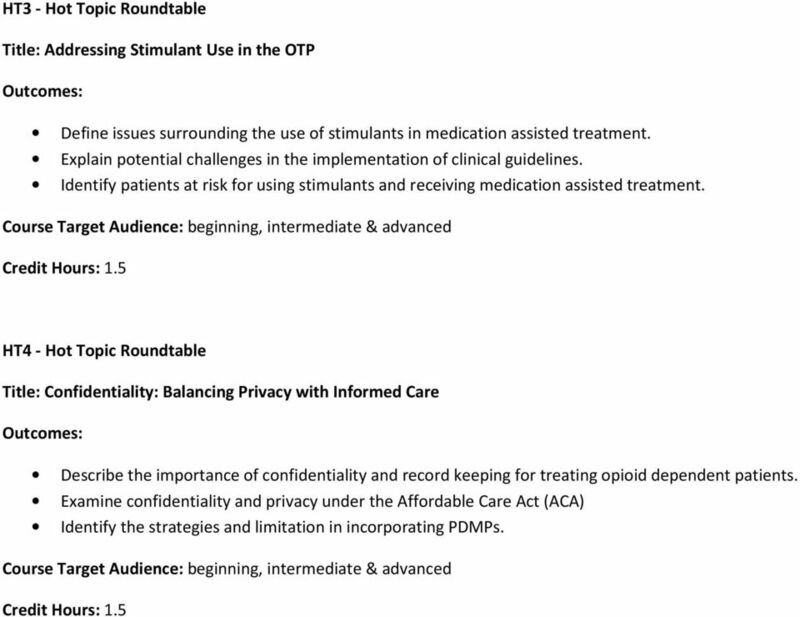 HT4 - Hot Topic Roundtable Title: Confidentiality: Balancing Privacy with Informed Care Describe the importance of confidentiality and record keeping for treating opioid dependent patients. Examine confidentiality and privacy under the Affordable Care Act (ACA) Identify the strategies and limitation in incorporating PDMPs. 5 HT5 - Hot Topic Roundtable Title: Dose Capping: Is It Still Happening Under the Current Federal Regulations? Develop understanding of federal regulations and SAMHSA guidelines as they pertain to dose capping. Identify two prerequisites for Opioid Treatment Program patients to take home medication doses. Identify at least two strategies to advocate for Opioid Treatment Program patients to receive appropriate amount of medication and take home medication privileges. #1 - Workshop Title: Managing Workplace Risks: Medical Marijuana and Disability-Related Topics Describe legal and practical issues raised by state and local laws permitting medical marijuana and recreational marijuana and impacting the workplace. Explain the current trends in workplace drug and alcohol testing programs. Discuss current legal trends in "reasonable accommodations" of employees' medical conditions. 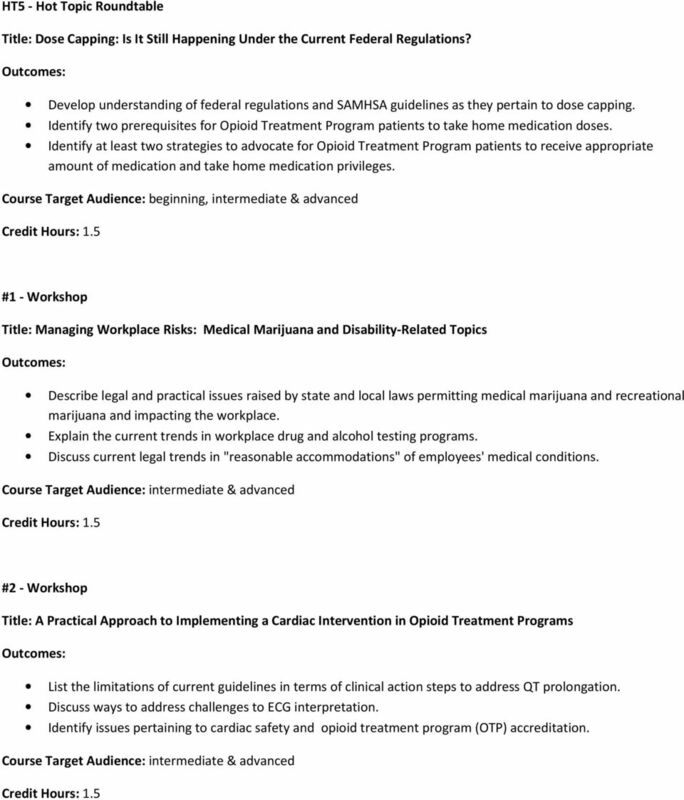 #2- Workshop Title: A Practical Approach to Implementing a Cardiac Intervention in Opioid Treatment Programs List the limitations of current guidelines in terms of clinical action steps to address QT prolongation. Discuss ways to address challenges to ECG interpretation. Identify issues pertaining to cardiac safety and opioid treatment program (OTP) accreditation. 7 B3 - Workshop Title: Neurobiological basis and interventions: Comorbid Opioid Use Disorder & PTSD Explain the correlation between the severity of PTSD symptoms and the severity of Opioid Use disorder. Describe the neurobiological link between PTSD and opioid use disorder. Identify integrated psychological and pharmacological interventions for comorbid PTSD and opioid use disorder B4 - Workshop Title: Current Issues:From the viewpoint of the patient Identify patient issues since the changes to the methadone regulations (42cfr part 8). Discuss peer services for patients in medication assisted treatment. List ways in which an educated patient can be a productive partner in the success of medication assisted treatment. 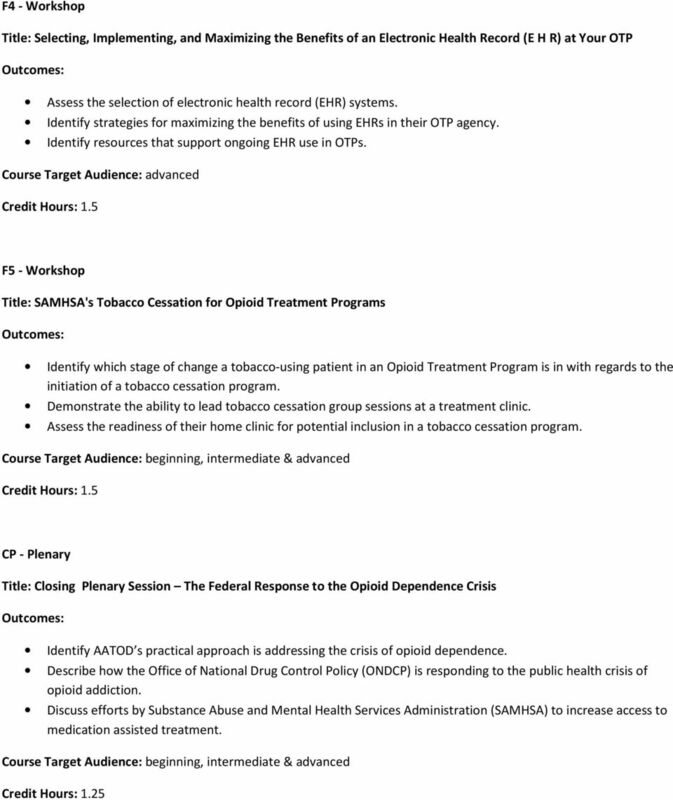 B5 - Workshop Title: Treatment for youth opioid addiction: pathways to engagement Discuss the use of buprenorphine and extended release naltrexone in youth opioid addiction Identify skills for promoting treatment engagement and medication adherence in youth with opioid use disorders. Describe developmentally appropriate approaches to improving treatment outcomes by promoting family involvement. 8 FS - Documentar Screening Title: The Fix: The Healing is Mutual Identify goals of the presentation. Interpret the documentary film The Fix: The Healing is Mutual Identify Peer Educators as part of the treatment module. Identify key steps in the integration of medication assisted treatment and Hepatitis C treatment. 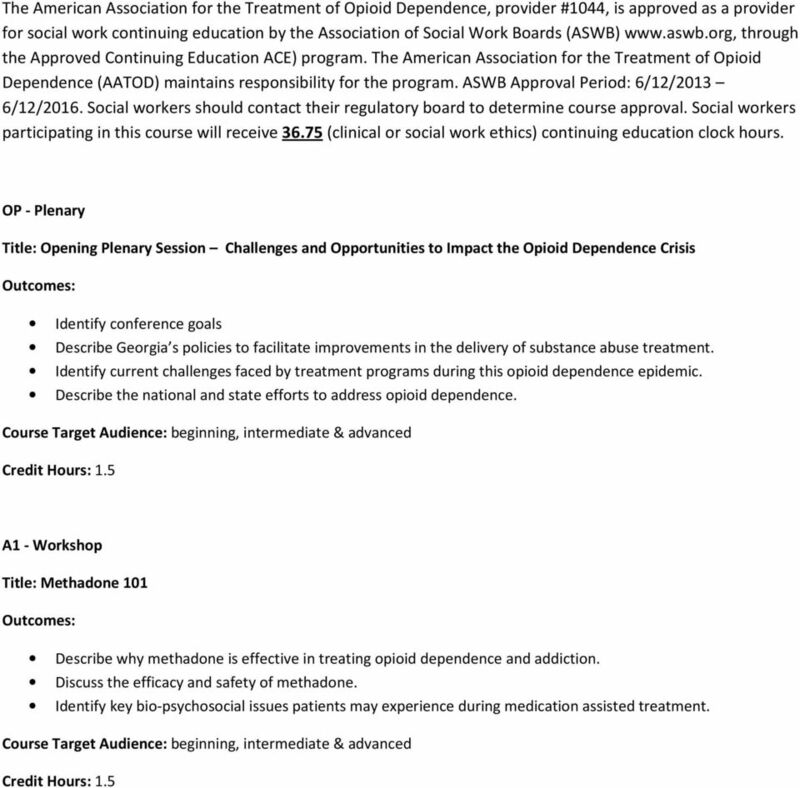 Identify non-traditional treatment model for inclusion in opioid treatment programs. 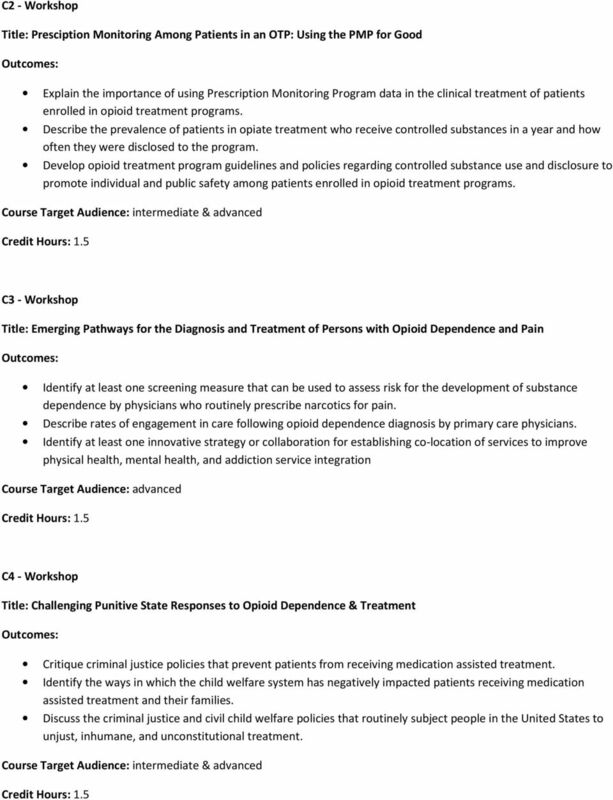 Credit Hours: 2 MP - Plenary Title: Middle Plenary Session Addressing a Public Health Crisis: Opioid Dependence Describe different viewpoints regarding the opioid dependence crisis. Identify current trends in prescription drug abuse research. Identify steps treatment providers can take during this opioid dependence epidemic Describe the public health efforts to address opioid dependence. C1 - Workshop Title: Building Effective Therapeutic Partnerships: The Most Important Evidence-based Practice Discuss the common therapeutic factors that affect treatment outcome and distinguish specific factors that affect the quality of the therapeutic relationship. Identify core counseling skills used to form and maintain a therapeutic relationship. Identify barriers to developing therapeutic relationship. 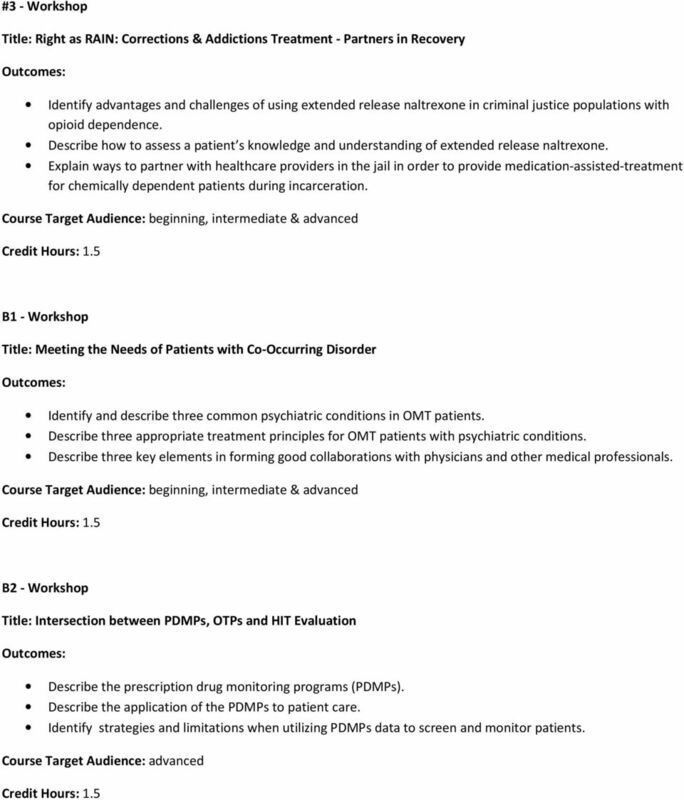 9 C2 - Workshop Title: Presciption Monitoring Among Patients in an OTP: Using the PMP for Good Explain the importance of using Prescription Monitoring Program data in the clinical treatment of patients enrolled in opioid treatment programs. Describe the prevalence of patients in opiate treatment who receive controlled substances in a year and how often they were disclosed to the program. Develop opioid treatment program guidelines and policies regarding controlled substance use and disclosure to promote individual and public safety among patients enrolled in opioid treatment programs. C3 - Workshop Title: Emerging Pathways for the Diagnosis and Treatment of Persons with Opioid Dependence and Pain Identify at least one screening measure that can be used to assess risk for the development of substance dependence by physicians who routinely prescribe narcotics for pain. Describe rates of engagement in care following opioid dependence diagnosis by primary care physicians. Identify at least one innovative strategy or collaboration for establishing co-location of services to improve physical health, mental health, and addiction service integration Course Target Audience: advanced C4 - Workshop Title: Challenging Punitive State Responses to Opioid Dependence & Treatment Critique criminal justice policies that prevent patients from receiving medication assisted treatment. Identify the ways in which the child welfare system has negatively impacted patients receiving medication assisted treatment and their families. Discuss the criminal justice and civil child welfare policies that routinely subject people in the United States to unjust, inhumane, and unconstitutional treatment. 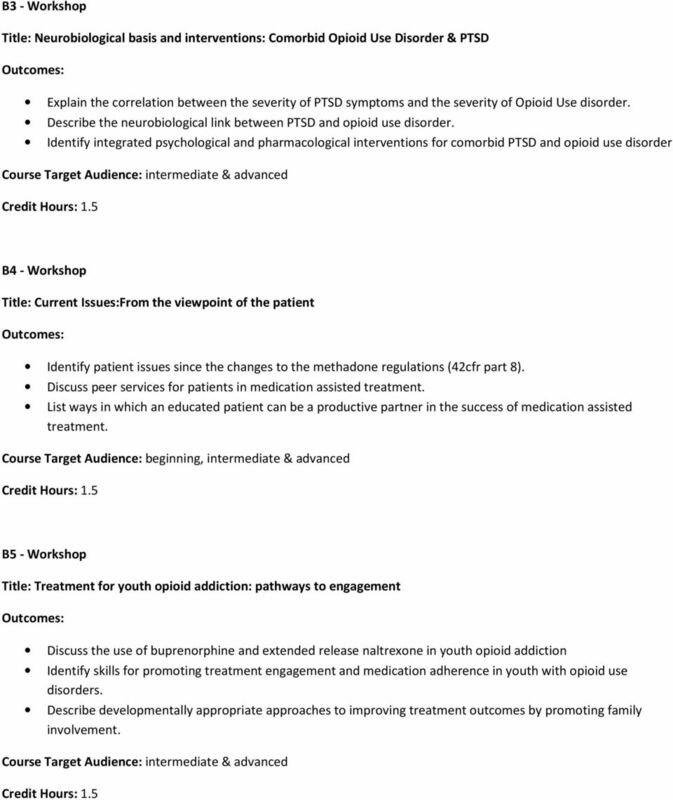 11 D3 - Workshop Title: Engagement and Psychosocial Treatment of Youth with Opioid Use Disorders Define 2 barriers to engaging young opioid users in treatment. Identify 3 evidence based approaches to engagement and treatment of young opioid users which have been shown to be effective. List the risks and benefits of medication assisted treatment for young opioid users. 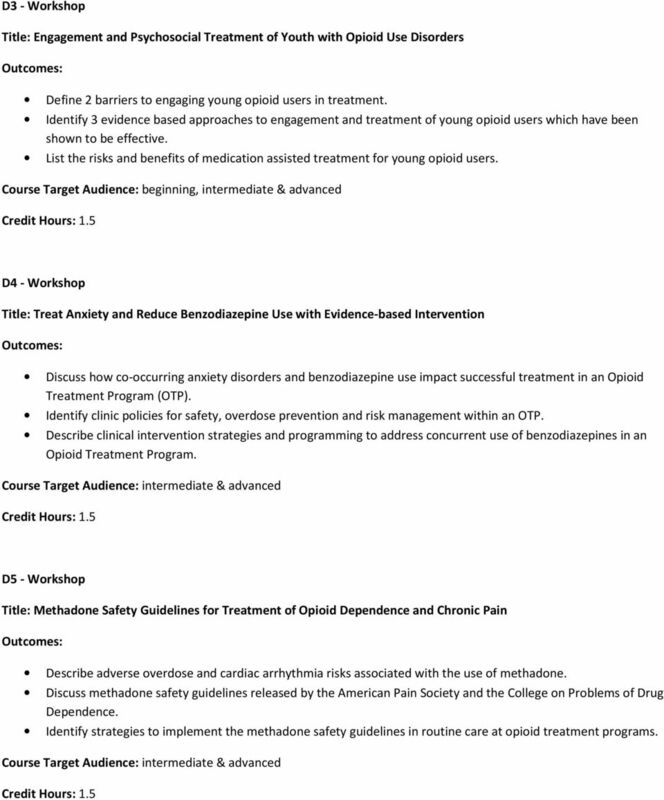 D4 - Workshop Title: Treat Anxiety and Reduce Benzodiazepine Use with Evidence-based Intervention Discuss how co-occurring anxiety disorders and benzodiazepine use impact successful treatment in an Opioid Treatment Program (OTP). Identify clinic policies for safety, overdose prevention and risk management within an OTP. Describe clinical intervention strategies and programming to address concurrent use of benzodiazepines in an Opioid Treatment Program. D5 - Workshop Title: Methadone Safety Guidelines for Treatment of Opioid Dependence and Chronic Pain Describe adverse overdose and cardiac arrhythmia risks associated with the use of methadone. Discuss methadone safety guidelines released by the American Pain Society and the College on Problems of Drug Dependence. Identify strategies to implement the methadone safety guidelines in routine care at opioid treatment programs. 12 IP - International Title: Outcome Measures in Heroin Addicted Patients Treated with Agonist Opioid Medication Identify measurable outcomes for patients being treated with agonist opioid treatment (AOT). Discuss psychopathology as an outcome measure in AOT. Describe the correlation between quality of life and AOT. E1 - Workshop Title: Smoking Cessation Made Easy, or How To Save $2,250 Or More Per Year! List medical illnesses associated with tobacco use. Identify the various medication options to help people quit smoking. Describe the neurobiological reasons for the difficulties in quitting smoking. E2 - Workshop Title: Legal Cannabis Use: Emerging Treatment Challenges in Methadone Treatment Discuss the evolution of medical marijuana and the potential treatment implication for patients in an MMTP being prescribed medical marijuana. Assess the political and policy implications of patients prescribed medical marijuana in an MMTP. Identify the various perspectives associated with the use of medical marijuana in a substance use disorder treatment facility. 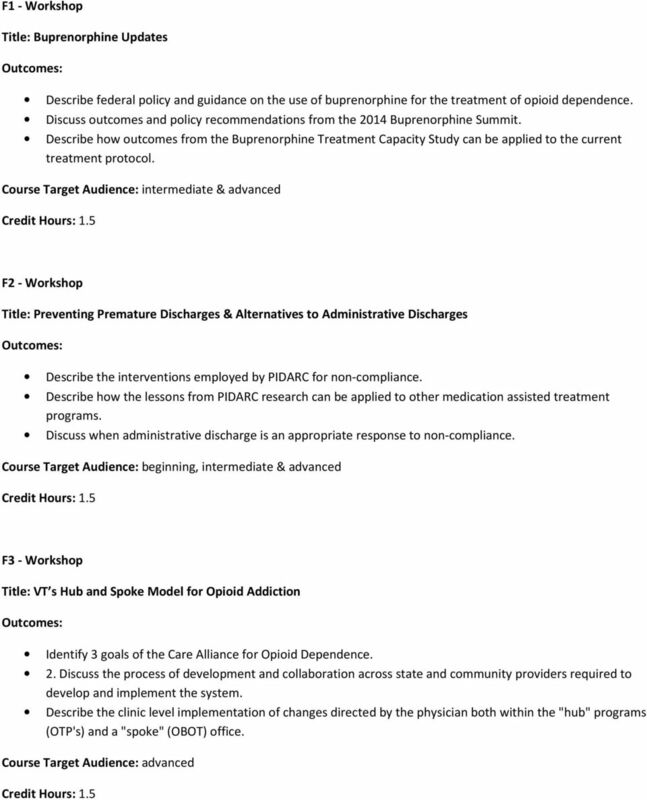 13 E3 - Workshop Title: Meeting the Need: Enhancing the Utilization of Pas-ARNPs in OTPs Describe the history of deployment of Physician Assistants and Nurse Practitioners in Opioid Treatment Programs. Recall available data evaluating care by Physician Assistants and Nurse Practitioners. Describe the role of the Affordable Care Act on increasing demand for, and access to opioid treatment. 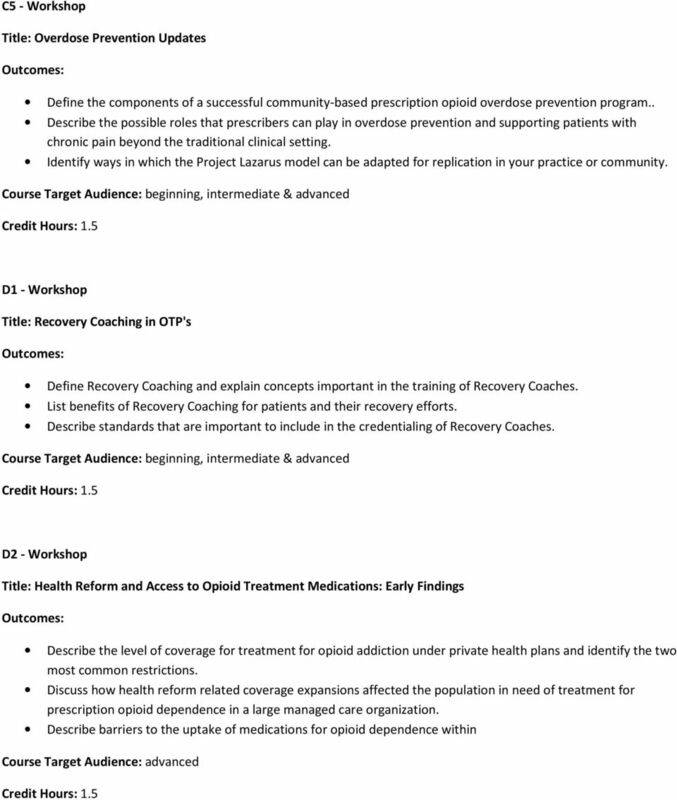 Course Target Audience: advanced E4 - Workshop Title: Best Practice Guidelines for Recovery-Oriented Methadone Maintenance Identify the issues the state of Pennsylvania is facing with opioid treatment programs and methadone maintenance treatment. Discuss phase-based best practices guidelines for recovery-oriented methadone maintenance. 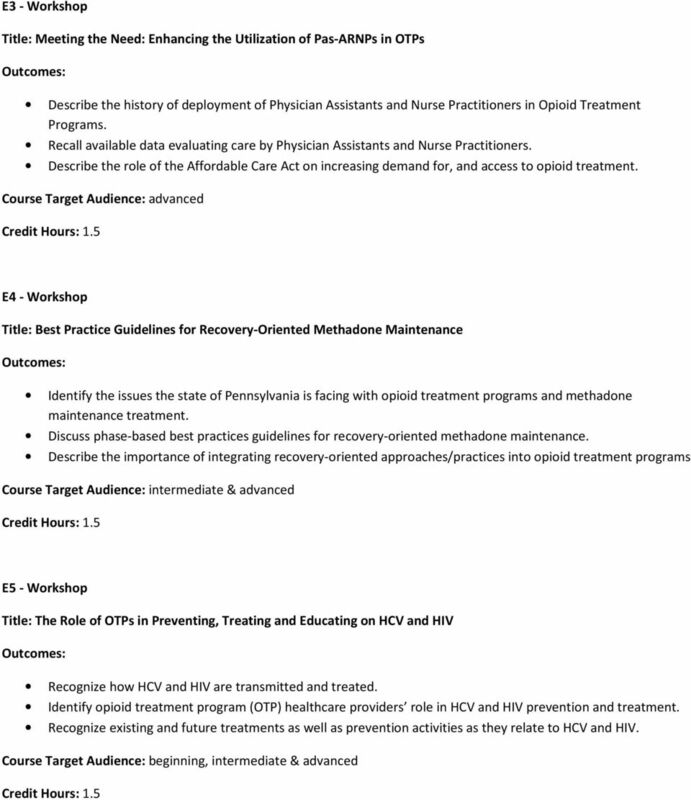 Describe the importance of integrating recovery-oriented approaches/practices into opioid treatment programs E5 - Workshop Title: The Role of OTPs in Preventing, Treating and Educating on HCV and HIV Recognize how HCV and HIV are transmitted and treated. Identify opioid treatment program (OTP) healthcare providers role in HCV and HIV prevention and treatment. Recognize existing and future treatments as well as prevention activities as they relate to HCV and HIV. 1) What would it take to get four or five FQHCs to implement ECHO, and how many patients can we serve? Discontinuation: Involuntary Discharge TYPICALLY A PROCESS NOT AN EVENT Objectives 2 Review indications for discharge. Develop a therapeutic approach, in the context of the nature of Substance Use Disorders. Integrating Behavioral Health and Primary Health Care: Development, Maintenance, and Sustainability Cici Conti Schoenberger, LCSW, CAS Behavioral Health Provider Sunshine Community Health Center Why Integrate? Division of State Operated Healthcare Facilities Alcohol and Drug Abuse Treatment Centers Jenny Wood Interim ADATC Team Leader HHS LOC Mental Health Subcommittee February 24, 2014 ADATC Locations R.J.